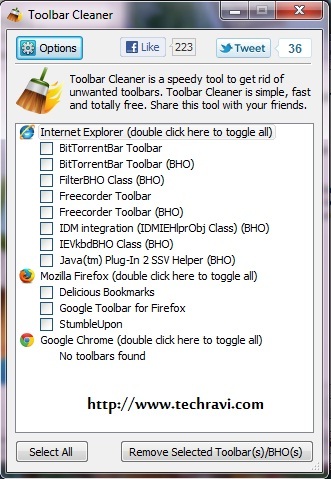 The big problem with internet browser like Mozilla Fireox, Chrome, are unwanted toolbars which came mostly with free softwares , you can avoid them by unchecking the box which asks you to install toolbar while installing a software .Mostly people skips this step leads to the clutter of toolbars. The most unwanted toolbars on your internet browsers are My web search toolbar,Zwinky toolbar, Google toolbar, Ask.com toolbar, Alexa toolbar. These toolbars are very useful like Google toolbar but some like my web search toolbar is meant for only tracking users browsing habits and install spywares into users computer which results in slow down of your computer. 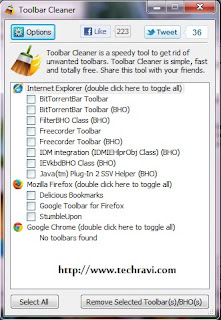 To get rid off from these toolbars, from your computer , you use this simple tool. It is of very small size just 742 kb only.